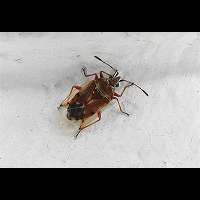 Seed Bugs are also known as Ground Bugs. Usually they are dark. 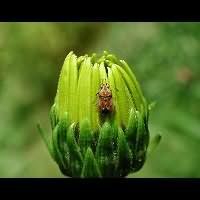 Most are small bugs, looking much like Plant Bugs. 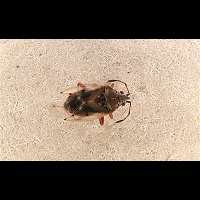 Often you can tell the difference by looking at the antennae: the Seed Bugs have antennae looking like those of the Shield Bugs: rather short and generally plump. 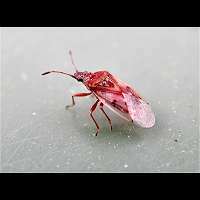 Those of the Plant Bugs are usually long, very thin and often one part is much longer than the others. 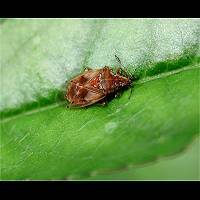 Another difference between the two families is that Seed Bugs have ocelli (small simplified eyes on top of the head), Plant Bugs don't. The Birch Catkin Bug, reaching a length of some 5 mm only, is a rather colourful representative of this family. Blowing up the picture will show you a curious species, for the wings appear to have been made out of glass. You can look through them, revealing more parts of the body than one usually can see in bugs. The species is very fond of birches and may appear in vast numbers. In autumn it is frequently seen on walls or in sheds. 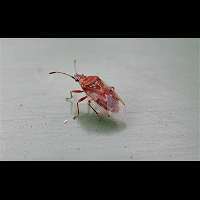 The Birch Catkin Bug is common all over the British Isles.